Did online chatter help the manhunt for Tsarnaev brothers? As authorities gave chase to the suspected Boston Marathon bombers overnight, an anxious public monitored the developments in real time on social media. Meanwhile, technology also made it possible for people to share information that could have jeopardized the lives of people on the scene in Watertown, Mass. -- where residents were on lockdown. Immediately after Monday's bombing, photos and videos of the event began spreading online through services like Twitter, YouTube and Instagram. Amateur sleuths began using crowdsourcing to compile and analyze data, pointing fingers at potential suspects. Friday morning news began to spread of a violent firefight that resulted in the death of one of the suspects, Tamerlan Tsarnaev. 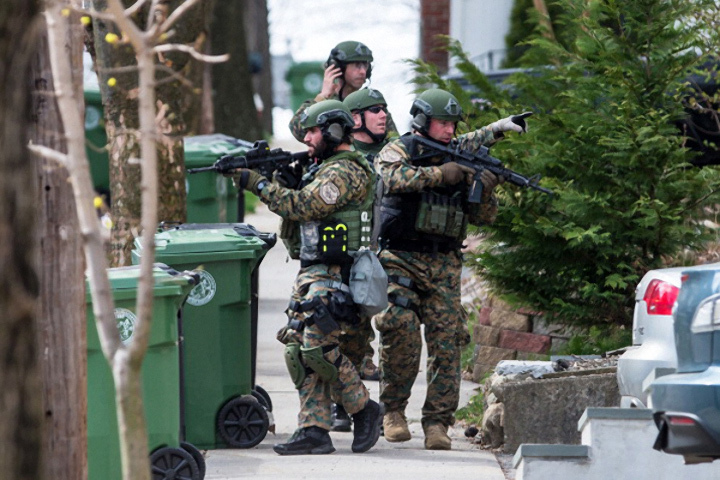 A manhunt for the other suspect, Dzhokhar A. Tsarnaev, 19, was in full swing as police went house-to-house in search of the man who was pictured in the white hat on the day of the bombing. As soon as Tsarnaev's identity was revealed, his profile on one of Europe's largest social media sites, VK.com, began spreading on Twitter, along with new photos of the suspect. Up-to-the-minute updates were posted immediately on Twitter from news outlets, reporters and social media enthusiasts. The chatter was so loud that the Federal Bureau of Investigations and Boston Police Department both tweeted out requests for people to stop posting sensitive information of the location of police operations. "WARNING: Do Not Compromise Officer Safety by Broadcasting Tactical Positions of Homes Being Searched," Boston_Police tweeted. Some who were following the updates in the real time were also tuning in to police scanners. Reuters deputy social media editor Matthew Keys quickly uploaded police scanner audio to Soundcloud. One of the most disconcerting clips was of a law enforcement officer yelling: "He is posting online 'I will kill you all like you killed my brother.'" The officer was referring to a tweet that was posted by a newly setup Twitter account that tweeted Boston Police with threats. The account's authenticity was quickly debunked. Gawker and Buzzfeed later reported that another Twitter account belonged to Tsarnaev. One of the most popular services for listening to police scanners online is Broadcastify - a platform for streaming live audio. Soon after the FBI and Boston police asked people to stop updating social media with sensitive information, Broadcastify stopped streaming police scans from Boston police, fire and emergency medical services. "MA State PD and Boston Police have requested via social media to not post search locations for the Boston bombing suspects - Boston area law enforcement feeds are temporarily offline due to this request." As the hunt for Tsarnaev continues, those looking for quick updates can check The FBI and Boston police's Twitter accounts.